Man of the match Nathan Rice. THEY have done it! After finishing minor premiers in the Southern Cricket Association, New Norfolk II has gone on and claimed the ultimate prize, defeating Bagdad for the Fourth Grade premiership at Tynwald Park on Saturday. 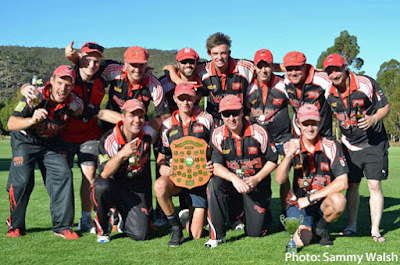 In what was their first premiership in 20 years, the Red Caps defeated Bagdad by the big margin of 96 runs. After being sent into bat, New Norfolk gave a great display of batting, making 6/234 off its 50 overs. In its best batting display of the season, the team put together a defendable target that was always going to be hard to get. Cody Neads batted well under pressure and made the opposition pay for its mistakes, making the high score of 67 in a very timely knock. From here it was the innings of Nathan Rice who soon had the crowd on his side. The 16-year-old came to the crease with plenty to do if his team was to post a good score. Facing more than his share of sledging, the kid known as "The Reason" stepped up to the plate and made his first ever half century, remaining 53 not out. Later named man of the match, Rice struck many boundaries and defied all odds in what was a memorable innings. Leigh Berry hung around and made 19, captain Chris Ashcroft 18 and Josh Walsh a handy 17. In reply Bagdad finished all out for 138 off 40.1 overs due to the very tight bowling of the Red Caps who took every chance that came their way. 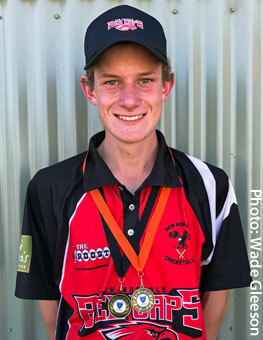 Josh Rowlands led the way taking 2-26 off 10 overs in a fine spell of bowling. Josh Walsh bowled as well as he has all season, taking 2-26 off eight overs. Cody Morgan took 2-19 off six overs, claiming two wickets in one over to have Bagdad on the ropes early. Jamie Hill chipped in with 2-19 off 4.1 overs. But then cometh the young man, cometh the moment when Nathan Rice turned his hand to bowling and took 1-20 off six overs in what must have been a very satisfying match for the youngster. Cleaning up was Aaron Drew who took 1-26 off six overs. It was a very good win for New Norfolk, which has been the most consistent team all season. These two teams met in the Twenty20 grand final with a win to Bagdad, but to turn the tables when it really mattered is a big feather in New Norfolk's cap. Well done to all. Playing on Saturday were: Jamie Hill, Mitchell Rice (12th man), Chris Ashcroft (captain), Glen Williams, Josh Rowlands, Cody Neads, Leigh Berry, Aaron Drew, Josh Walsh, Cody Morgan, Nathan Heron and Nathan Rice. New Norfolk II's last premiership win was 20 years ago in the now defunct Derwent Valley Cricket Association in 1996/97 when they defeated Glenora/Ellendale by 148 runs at the Bushy Park Showground in the B-Grade grand final. The team then was: Rohan Windsor, Sam Wardlaw, Robert Crane, Glenn Eiszele, Jarrod Browning, Shane Eiszele, James Bramish, John Walsh, Rodney Hayden (captain), Dale Robertson and Corey Reeves. Scores: New Norfolk 10/241 d. Glenora/Ellendale 10/93. In that same season the club made it the double with New Norfolk I winning the A Grade premiership, defeating Old Beach at Bushy Park. New Norfolk II's last grand final appearance before Saturday was in Division 3 of the SCA in season 2009/10 when it was defeated by MacKillop Beltas at Richmond. The team was: Nathan Heron, Daniel Taylor, Chris Ashcroft, Jarrod Browning, Simon Crane, Richard Munnings (captain), Jeremy Cashion, Luke Browning, Bradley Chaplin, Khyle Ashcroft and Graeme Rowlands. Scores: MacKillop 6/181 off 48 overs d. New Norfolk II 10/158 off 41.3 overs.